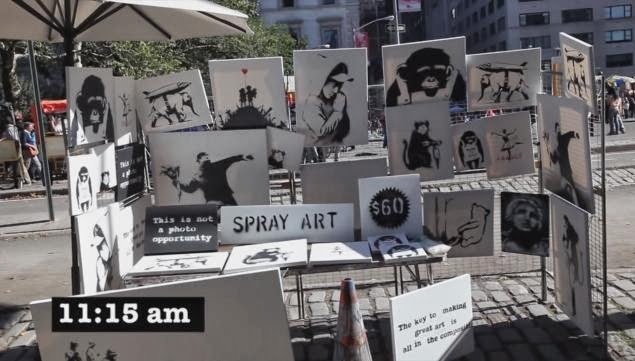 The next time you pass an art vendor on the street, take a closer look at the pieces for sale: They couldbe new artworks from Banksy. The British street artist Banksy has once again cleverly thumbed his nose at a contemporary art market that has hijacked and commoditized his art, despite the artist's protestations. As part of a publicized stay in New York City this fall, the street artist sold original, signed canvases through a pop-up vendor, with pieces priced at $60 each (the larger canvases could be worth as much as $224,000 at auction). 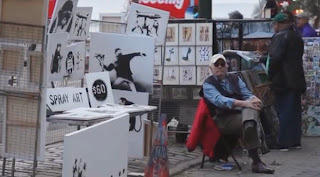 As this amusing video shows, the results were humorously underwhelming, with most pedestrians glancing only briefly at the works while passing by. Total revenue from the sale was a whopping $420.